The Badlands National Park, South Dakota, is a place we had driven through on two previous trips, but we never had the time to really stop and explore the amazing rock formations, the wildlife, birds, and trails. This time we decided to camp here for several days and experience more than a quick drive-by. Once here, we realized that we really need to devote more than a few days to this magnificent park so we have put it on our ” must visit again” list. The weather was cooler than previous times, it had been 114 degrees back in August of 2011 when we stopped on our way back from Yellowstone, and it rained steadily on Sunday. We took advantage of the rare opportunity to see water and erosion at work in the park. The White River was close to flooding, rivers ran in the clay floor of the Badlands carving new pathways, and the colors were just beautiful! All of the flowing water was the color of coffee with cream, a light tan. We took full advantage of our time in the Badlands: driving the Badlands loop several times in the Jeep, visiting the Fossil Exhibit Trail, every scenic overlook, and the Big Pig Dig site ( actually not a pig fossil at all, but a small hornless rhinoceros), and the Ben Reidel Visitor Center. Hiking and biking were limited because of the rain and the muddy conditions. We went into Wall on Memorial Day and visited Wall Drug Store and Wounded Knee: The Museum. Of the two places, I preferred the museum, and was fascinated by the history of the December 29, 1890 Wounded Knee Massacre. There were lots of historical photos and documents, and several multi-media presentations. Charlie preferred Wall Drug, though he kept his wallet in his pocket! 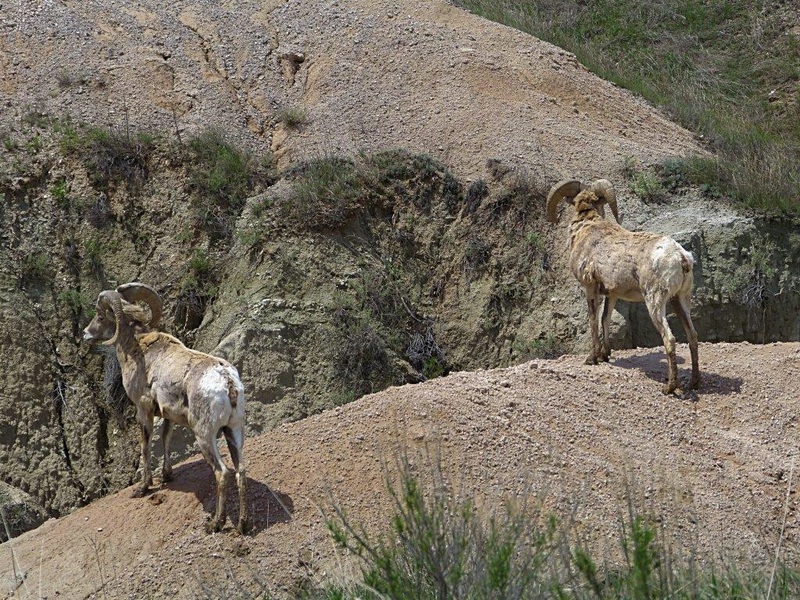 Wildlife was abundant in the Badlands, especially Meadow Larks and Big Horn Sheep. I saw one small snake on Monday, but no rattlesnakes. We are heading to the Black Hills tomorrow, provided the roads are not affected by flooding. This entry was posted in Alaskan Road Trip and tagged badlands National Park, South Dakota on May 26, 2015 by Ramblin' Rose. Great bighorn captures. Where did you camp? We’ll be checking out the Black Hills and Badlands in September. Thanks, Ingrid. Charlie gets credit for the pictures:) We camped in Interior at the Badlands/White River KOA. It was a few miles from the park entrance on Route 44. Next time we will try to camp in the park. Skip the KOA’s! On your return trip, I highly recommend staying at the Cedar Pass Campground that is one of the national park campgrounds in the park. The sites on the outer loop are the nicest and the view is amazing! You can bike right from your campsite. I know Charlie would probably get some pretty neat pictures of the critters that are out and about in the evening too! Agreed, but it was Memorial Day weekend and Cedar Pass cg was full! We were down the road from it. The KOA was one oft the nicest we have ever stayed at.